Take some time and enjoy making some or all of these footprint crafts. You can make footprint crafts by tracing, dipping, or pressing! Footprint crafts not only make wonderful gifts and decorations, they are also a unique way to make a record of a child's growth. 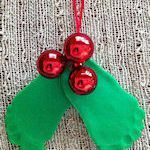 Discover how you can use your baby's footprint to make a fun Christmas gift everyone will love getting! This craft how-to shows you how to create an adorable canvas print featuring a footprint heart. Check out this fun footprint craft made from paper plates. Paint the bottom of your kids' feet and let them literally walk all over this t-shirt. Learn how you can make angel prints using a footprint and hand prints. Check out these cute ghosts that were made by tracing shoes. Craft a colorful turkey using a footprint as the body and hand prints as the tail feathers.